When it comes to those little USB flash drives, one can easily overlook the importance of read/write speeds. The idea of having 64GB of storage in your pocket is great, but what good is it when the drive takes an hour to transfer your data? Most flash drives are actually very slow, making advanced usage cases such as running live Linux distros or on-board software from them a less than thrilling experience. Enter the Patriot Xporter XT Rage, a USB 2.0 flash drive that boasts read speeds of 27MB/s and write speeds of 25MB/s. This little drive has been my sidekick for over a year, and it still looks like it did the day I took it out of the package. Its plastic frame doubles as its own cap. Just slide the two larger sections of the drive together to reveal a USB 2.0 connector. Slide them apart and the drive is protected against most of the elements. The end of the connector sits flush against the protective casing, so it is still far from waterproof. The frame also doesn’t lock tight in either position. A slight knock could leave the connector exposed to harmful elements which might cause a little damage when shuffled around in a book bag or in your pocket. The boasted speeds are actually quite accurate, though I was able to achieve write speeds well beyond the advertised 25MB/s for short bursts during a large file transfer. Compared to the average 2MB/s I receive from the dozens of other flash drives that sit in my drawer, the Patriot Xporter XT Rage is in a class far above the pack. Read speeds stayed around 29MB/s which is also above the advertised benchmark. This makes it a great choice for folks that frequently transfer video files and run programs directly from the drive. There’s a USB 3.0 version of the Rage called the Supersonic Rage which advertises average transfer speeds of 180/50MB/s. Currently, the price difference between the two is just a few dollars on Amazon. 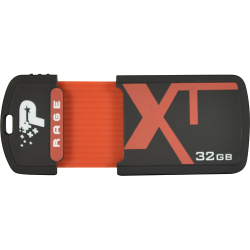 You can pick up the Patriot Xporter XT Rage for about $36 for 32GB in capacity. You can buy them with up to 64GB at around $80. Previous articleCould Apple Start Producing its Own Desktop Processors Again? Next articleWhat Can You Do With A Raspberry Pi? Ryan Matthew Pierson has worked as a broadcaster, writer, and producer for media outlets ranging from small local radio stations to internationally syndicated programs. His experience includes virtually every aspect of show production including audio and video programming. He currently writes for several technology blogs including LogicLounge and LockerGnome.